NEW DELHI - Feb. 27, 2017 - PRLog -- The consultants of DexLab Analytics, the premier institute of India in the domain of Big Data Analytics are conducting a three-month long training program for the team of Business Intelligence, Data Warehousing and Analytics representatives of Avaya, a multinational company that offers high-end solutions, like Cloud, Team Engagement, Customer Engagement and Networking. 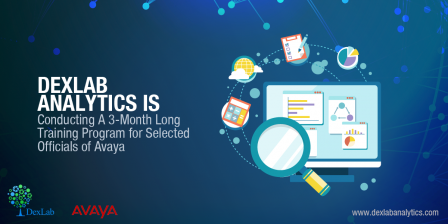 The training will be held at the company's Pune branch, and the representatives from Avaya will be staying in Pune for the coming three months, until the session is completed. With an extremely talented and diligent team of seasoned corporate trainers, DexLab Analytics takes immense pride and honor in providing an informative training experience to the individuals. The three-month long training is going to focus on subjects, like R Programming, Data Science using R, Statistical Modeling using R, Advance Microsoft Excel - VBA, Macros, Dashboards and Tableau BI & Visualization. The main aim of this comprehensive module is to make the team of Avaya absolutely data driven and data ready. The corporate training program starting from 27th February 2017 will go on till 27th May 2017, at DexLab Analytics' Pune office campus. Therefore, it is understandable that the need for analytical skills is going to be a driving factor for the people in association with the digital world and networking. In the context to this event, the CEO of DexLab Analytics said, "A team of experienced and seasoned corporate professionals at DexLab Analytics is capable of offering instructions, in the highly demand skills like R Programming, Big Data Hadoop, Business Analytics, Data Science, SAS Programming, Machine Learning, Visualization using Tableau and Excel and is looking forward to pave a path of Corporate Training Excellence in Big Data and Analytics for all our Corporate Training Partners." Today, the skills in Data Analytics and Big Data are emerging as vital components in the digital world and the concept is being acknowledged by the concerned specialists, like never before. They hope this endeavor to boost data analytics will motivate more people, which will eventually pave more ways for innovative data-centric modules and diagnoses. DexLab Analytics is the prestigious data science and analytics training organization, located in Gurgaon, Delhi NCR, with branches in Pune, Maharashtra and Noida, Uttar Pradesh. Over the years, it has earned a favorable reputation by excelling in high demand digital courses, such as R programming, SAS, Big Data Hadoop, Credit Risk modeling, Tableau, Business Analytics, Excel etc. Online courses on data analytics for the above-said subjects are also offered. M. G. Road, Gurgaon 122 002, Delhi NCR. Gokhale Road, Model Colony, Pune – 411016.